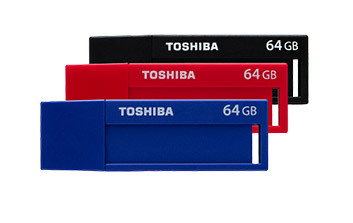 Transfer your video and other large data files with the SuperSpeed 3.0-Compliant USB Flash Memory from Toshiba. The new series can transfer content 2 times faster* than with USB2.0! This series is available in four different capacities: 16, 32 and 64GB. The drives are also usable in devices equipped with USB2.0 hosts. 9mm x 33mm memo space and writable labels lets you find the right drive in an instant. The functional and minimalistic design makes it easy to use. * Read speed using this device with a USB3.0 interface is approx. two times faster than with a USB2.0 interface. Maximum data write and read speed may vary depending on the host device and file size.